As part of the ArcGIS platform, GeoPlanner for ArcGIS and ArcGIS Pro can help city decision-makers and planners understand and visualize the dynamics of urban infrastructure projects as well as help them optimize the impact of these projects. GeoPlanner and ArcGIS Pro offer new opportunities to incorporate GIS into planning and design practices. GeoPlanner allows you to create and assess multiple planning alternatives. ArcGIS Pro helps you understand these alternatives through 3D visualization. The ArcGIS Platform transfers changes between these applications. This enables uninterrupted workflows and helps to facilitate valuable insights. Let’s say your organization has GIS professionals who use ArcGIS Pro and a planning team that works with GeoPlanner. The ArcGIS Platform can help these two groups collaborate on projects through the sharing of data, analysis, and information. GeoPlanner scenarios and analysis results are saved to ArcGIS Online as hosted feature layers. These layers can be accessed and rendered in 3D in ArcGIS Pro. 3D visualization helps you evaluate the impact of current conditions and proposed changes within your study area. For example, you can explore how the orientation of surrounding buildings affects your proposed development. Valuable insights gleaned from visualizations in ArcGIS Pro promote evidence-based and analysis-driven design alternatives in GeoPlanner. Changes you make to hosted feature layers are available in real-time in both GeoPlanner and ArcGIS Pro. As a result, ArcGIS Pro and GeoPlanner comprise a synchronized platform for seamless geodesign workflows. 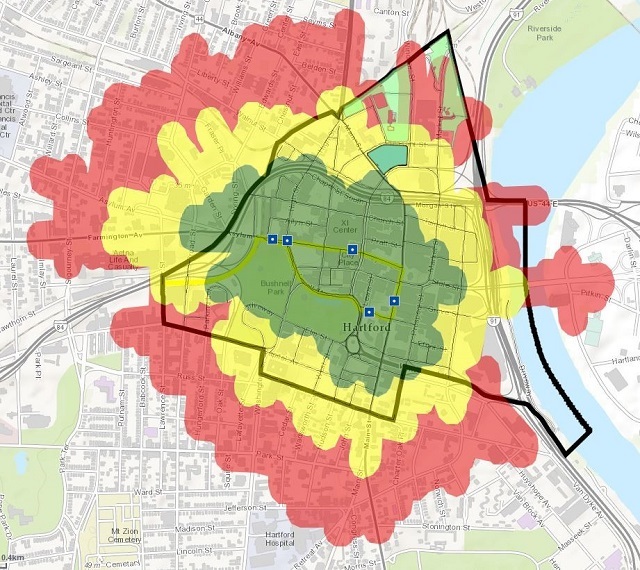 Let us now explore how GeoPlanner and ArcGIS Pro can be used in tandem to locate and plan the optimal site for construction of a minor league baseball stadium in Downtown Hartford, Connecticut. We begin by importing our data into a scenario which will model the current built conditions and zoning districts in Downtown Hartford. The scenario shown above has a transportation layer, point of interest layer, and land use layer, and additional contextual layers such as parcels and building footprints to supplement the scenario. We can further create layers showing both suitable and unsuitable land for stadium construction by using GeoPlanner’s analysis tools. Since the city is proposing a 220,000 square foot stadium, we’ll look for areas where contiguous parcels meet this square footage requirement. GeoPlanner’s sketching and visualization tools combined with knowledge of the local area help us further refine our search. For example, although a parcel on the state capitol building grounds has the requisite area, it is unsuitable for stadium construction. 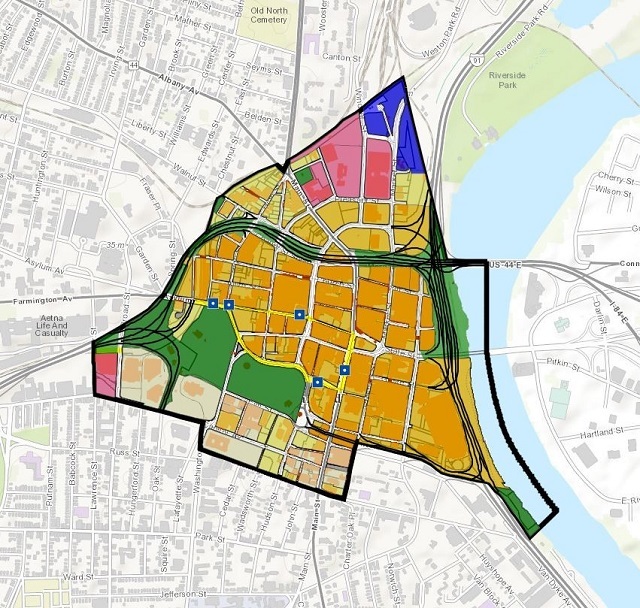 Using analysis tools, sketching tools, and scenarios, we conclude that there are three possible areas of contiguous parcels upon which to construct the Yard Goats stadium. We will determine which site is best positioned to promote use of CTfastrak among Yard Goats fans as they head to the stadium on game day. This conclusion is best reached by combining GeoPlanner’s analysis tools with its visually instructive classification scales. We see that there is only one contiguous area of parcels upon which to build the stadium in order to promote CTfastrak use among Yard Goats fans. By using the Create Travel-Time Areas tool, we can model the distance that a pedestrian could feasibly travel from a CTfastrak Route 101 transit stop in 5, 10, or 15 minutes. We classify these travel times on an intuitive color classification scale, with a 5 minute walk designated as optimal (green). With our location for stadium construction identified, we now use the 3D visualization capabilities of ArcGIS Pro to determine the orientation of the stadium. Modeling the design of our stadium to be similar to those of other minor league baseball teams, we set a 9,000 seat capacity with no outfield seating. Therefore, we determine that the stadium should be oriented with home plate somewhere along the northern or western edge of the final location, since this would allow for excellent grandstand views of the skyline of Downtown Hartford or the nearby Connecticut River. Locating home plate close to the corner of Pleasant & Main Streets would allow spectators to take in an aesthetically-pleasing view of the city. Bringing the Yard Goats to Hartford is a boon for the city. By constructing a baseball stadium within walking distance of a CTfastrak transit stop, the city can promote the use of public transit as an enjoyable, affordable, and fun part of a family-friendly summer activity: taking in a ballgame in the heart of Hartford. Choosing to work with both GeoPlanner and ArcGIS Pro is a smart decision for planners and decision-makers in all industries. Learn more and request a free trial of GeoPlanner for ArcGIS and ArcGIS Pro to start taking advantage of the planning power of these applications today.